Baptism clothes are an important part of the celebration. These are designs that will inspire the true meaning of baptism and all will look elegant and fancy. If you are looking for Christening Clothes for your child, here you will find high quality handmade designs perfect for that memorable occasion. We have partnered with Nido de Abeja (Bee's Nest), a Mexican designer of christening gowns, dresses and in general all kinds of baptism clothes, first communion, presentations, and children clothing for weddings. Nido de Abeja has been designing, making and selecting the best materials, and handmade embroideries for over 20 years. They are experts in artisan creations using specialized embroideries and knitting techniques such as smock, rococó and Nido de Abeja where they take their name. These techniques make their creations a true work of art and they are distinguished by their quality, creativity and good taste offering customers elegant designs. 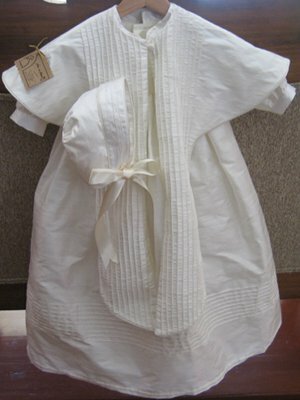 All boys christening gowns shown below are made from raw silk (not from knitted silk which is a light fabric). Raw silk is high quality and with a thicker feeling which allows to embroider the amazing designs. 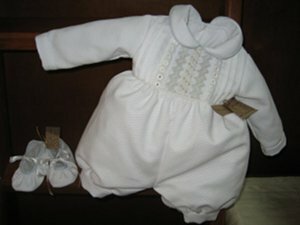 Here is a baptism gown in two pieces. This garment is for older kids in sizes 1 to 4. It can be made long sleeve in white or beige. This baptism gown is called ropón. This garment is more traditional to the other models with pleats and also made with raw silk. It is one size fits all. It can be made white or beige and is the only one that includes a hat. 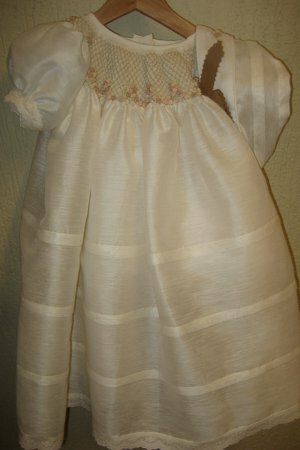 This baptism gown is called baggy for its loose-fitting style. This garment is one piece and it can be made with embroidery or pleats on raw silk. It is one size fits all. It can be made white or beige or combined. Girls christening dresses embroideries are made by hand which makes it a unique work of art. 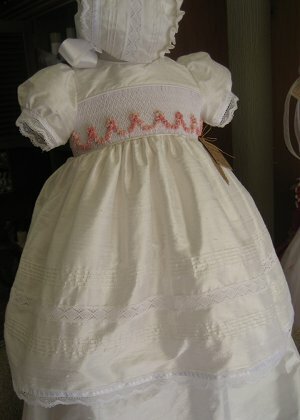 This baptism dress has buttons on the back and embroidery in the front with a unique design. Embroideries are always handmade. It can be made with raw silk or organdy which is a cotton fabric having a durable crisp finish. Colors available: white and beige. 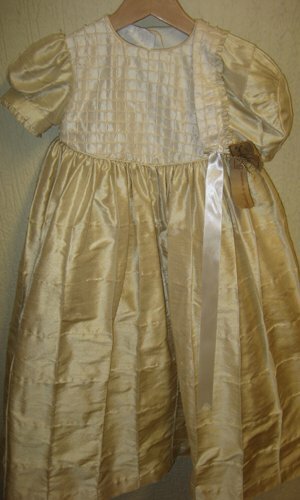 This baptism dress is longer than the other dresses covering the feet. It has unique embroidery and a more traditional style. 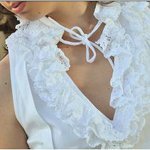 It can be made with raw silk, muslin which is a cotton pattern design, or organdy which is a cotton fabric having a durable crisp finish. Colors available: white and beige. 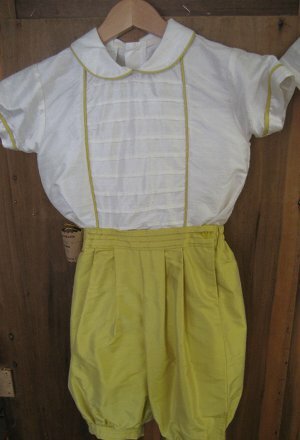 This dress is for older girls with a unique embroidery in the middle. Embroideries are always hand made. It can be made with: Colors available: white and beige. Orders are currently shipping in 1 week. We made shipping costs easy! If you have any questions about the baptism clothes we sell, or anything else, please contact us using this form. Thank you!